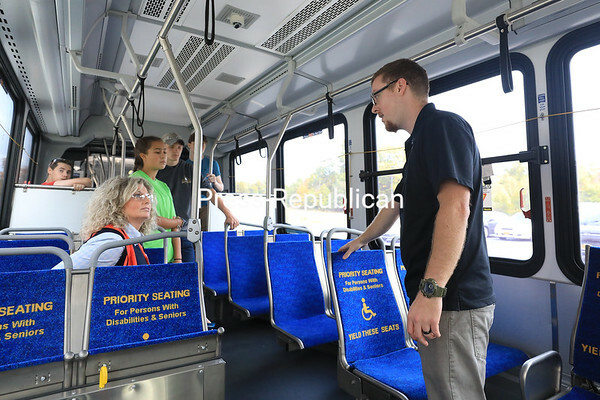 Nova Bus Industrial Engineering Technician Derek Bradt (right) explains the differences in seating on commuter and coach buses to visitors from Moriah Central School during North Country Manufacturing Day at Clinton Community College’s Institute for Advanced Manufacturing. More than 300 high school students from Tupper Lake, Moriah, Westport, Chateaugay, Beekmantown, Adirondack P-Tech and CV-TEC participated in the annual event, along with local manufacturers Nova Bus, Norsk Titanium, Plattco, DOORspec, Mold-Rite and Bombardier. Students were invited to tour the IAM building while interacting with employers and asking questions about the manufacturing industry. The event was sponsored by ETS, Rulfs Orchard, the Institute for Advanced Manufacturing at Clinton Community College, Sam’s Club and the Workforce Development Institute.